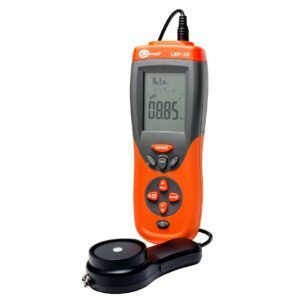 The LXP-10A digital meter family allows for a very precise measurement of illuminance. Thanks to the high resolution (0.001 lx) it allows for escape route emergency light measurement. The light meter has built-in memory for measurement result storing, and additional function making work much easier. Auto power off (5,10 or 15 minutes) or disable AUTO power off. The LXP-10B digital light meter allows for a very precise measurement of illuminace. Thanks to very high resolution (resolution 0.01 lx) allows for measurement of emergency escape routes. The light meter have built-in memory for storing results and additional function making work much easier. Measurement resolution 0.01 lx (0.001 fc). No need for correction factors calculating for different light sources thanks to a good spectral sensitivity, guaranteeing the correct measurement of intensity of the illumination regardless of the nature of radiation. Peak-hold function for tracing the highest light pulse with duration longer than 0.1 s and less than 1 s.
Select measuring mode in Lux or FC scale. Data transmission via radio connection using an optional adaptor OR-1. The digital light meter is a precision instrument used to measure illuminance (Lux, footcandle) in the field. It is meet CIE photopic spectral response. It is fully cosine corrected for the angular incidence of light. The illuminance meter is compact, tough and easy to handle owing to its construction. The light sensitive component used in the meter is a very stable, long-life silicon photo diode and spectral response filter. Measurement resolution 0.1 lx (0.01 fc). Auto power off (5,10 or 15min) option to disable AUTO power off. Built-in memory - 99 result, with can be checked in the meter or PC.